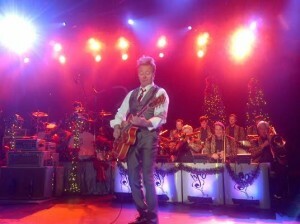 I’m not much for Christmas-themed music so it was with some trepidation that I ventured down to the Chumash Casino recently to catch the Brian Setzer Orchestra and his Christmas Rocks! extravaganza.To be honest at the risk of sacrilege, I’m not real fond of the holiday. Period. Still, the unheralded Setzer is the undisputed modern rockabilly king, a talented musician who earned his 15 minutes of fame as the leader of the Stray Cats, one of my faves from the early 1980s. Like many bands, they fell from grace as quickly as they rose but that’s another story. Plus, the hour drive from SLO was a breeze compared to what my pal Adrianna has battled many times in subzero Michigan winters to see her rockabilly hero. So off I went telling myself sometimes it’s best to leave your biases and assumptions at home. Let me tell, you this was one of those times. Calling his show an extravaganza might be the understatement of the year. It wasn’t 3 1/2 hours of Pearl Jam but it was close, if you know what I mean. And this hepcat ain’t jiving when he says orchestra: five saxophones, four trombones and trumpets apiece plus a cool, stand-up bass painted like a hot-rod. Certainly not your Momma’s ordinary swing band. Still, the obvious star of the show was the diminutive Setzer who hit the stage in a shiny, gray three-piece suit and didn’t slow down for the entire 105-minute performance. I get the feeling Setzer was born 20 years too late, that he would be more at home alongside Buddy Holly, or even Gene Krupa. I knew we were in for a rock and roll variety show when he kicked off the festivities with the ‘Munsters’ theme. Again, I may be biased but the evening’s highlights were definitely Setzer’s original Stray Cats and BSO songs and not the many holiday standards he mixed in. These tended to mute the energy and momentum of the music. Only when he kicked his horn section off stage and did a cool rockabilly jam with his three-piece band on Eddie Cochran’s ‘Nervous Breakdown’, ‘Brand New Cadillac’ and the classic ‘Ring of Fire’ did the true spirit and soul of rock n’ roll appear. This music is best when stripped down to its core, three guys cranking out a three-minute ditty about dreams and desires. As much as I love the Chumash, it probably wasn’t the best venue for Setzer and his Orchestra. Swing/rockabilly wants us to kick over the chair, jump around and boogie the whole time. So it wasn’t until Security let the crowd up front towards the end of the show that the dance frenzy really kicked in. That made the rousing encore of ‘Rock This Town’, one of the best rock songs ever, all the better. Setzer surely made his mark on modern music as one of the leaders of the rockabilly revival in the early 1980s. If nothing else, his rare visit to the central coast proved that an artist can evolve and still stay true to their roots.